General histories listed on the page for Books about Angus & Kincardineshire, in particular Warden, vol. 5, pp. 104-110. For the full range of maps of Ruthven, see National Library's Maps. Geograph.org: Ruthven - recent photographs of Ruthven. National Grid ref. NO2848. Located at National Grid ref. NO286488. Built 1859. The mediaeval kirk belonged to Arbroath Abbey. A fine photograph of the kirk on the Scottish War Memorials site. There is an article, with photographs, on Ruthven Parish Church in A Corpus of Scottish Mediaeval Parish Churches. Patrick Barty 1823-1870 b. 5 Jan 1798, eldest son of Thomas Barty, min. of Bendochy PER; ord. 7 Aug 1823; d. 24 Jun 1870 unmar. Inside the kirk: Photographs & names. 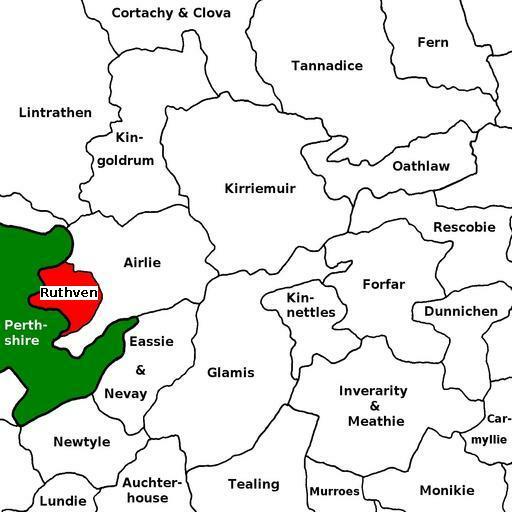 Ruthven was in the Commissariot of Dunkeld [NRS CC7].